- The bulk of the film is taken from the Kino Bluray (24fps version). I desaturated the footage to black and white, as I was not satisfied with the tinting in any version. - The opening of the film through Carlotta speaking to the owners is taken from the BFI bluray, as it digitally removes the troublesome hair that wiggles all around the gate. Because the BFI bluray runs at 24fps and uses frame duplication to sync to it's soundtrack, I had to use a decimate filter and then carefully match the footage frame by frame to the kino source to ensure there were no frames missing. - Some scenes were taken from the older Image bluray (using the same underlying master as Kino), because the Kino master inadvertently crushed the black levels of some scenes while trying improve the look of the tinting. - Some shots in the cellars were taken from the newly discovered sound reel of Phantom on the BFI disc. It lacked the damage in the other 35mm copy. Opening Titles: While the complete original titles are lost (the 16mm print splices in a copy of the 1929 titles), sections survive in the trailers, and I used these snippets to reconstruct a section of the titles. 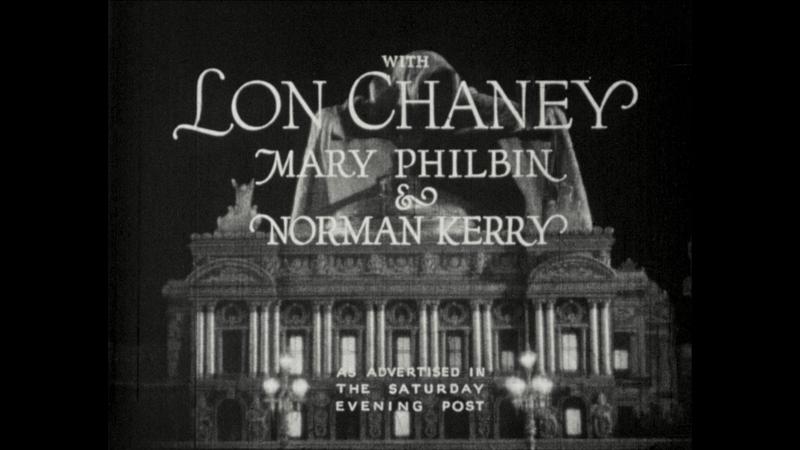 The director's credit comes from the 1929 version. Rooftop scene: This is the only scene which I kept tinted to preserve the two tone Handschiegl technique on the Phantom's cape. The shots of Christine and Raoul come from the BFI bluray (better detail), with color correction to fix the rather poor tinting. The shots of the Phantom come from the Kino disc (better detail than the BFI, which again uses footage from the earlier restoration). Finale: The Kino Bluray and 24fps Image bluray again have frame blending from an incorrect frame rate conversion. The BFI bluray is tinted so strongly here as to be indiscernible. Even color correction shows that there is no detail to regain. I took the interlaced 20fps Image bluray and deinterlaced it, eliminating as many blended field frames as possible. This results in a rather soft look with lots of dirt (the interlaced mater had no computer restoration done on it), but it's the best the sequence has ever looked on home media. General edit: It's a fairly faithful reconstruction of the original continuity, just running at a varied framerate to accommodate the different lengths of shots in the 1929 version. There are some shots in the 16mm that I've rearranged for continuity reasons (they clearly were spliced in incorrectly in the 16mm dupe). There are some quick shots cut out for similar reasons. The 1929 footage is obviously different takes and angles from the 1925 footage, but for the most part you can match it up quite well. I kept one new title card from the 1929 version, as taking it out would have otherwise introduced a big jumpcut. Similarly, I made one new title card for the same reason in the first Carlotta scene. What an extraordinary restoration of one of my favorite films! This is the stuff that distributors should be doing themselves. Downloading now, thanks for the work and the share. Shame that Universal pretty much gave up on one of their most important pictures, they did not even bother releasing it themselves on BD. Current time: 2019-04-21, 01:01 AM Powered By MyBB, © 2002-2019 MyBB Group.